IN his continuing search for the more weird, wacky and wondrous in the world of travel, David Ellis says one of Germany's biggest shipyards is an amazing 42km inland, so ships that have been built there since 1795 have had to make the long slow and winding journey all that way downriver through fields and farmlands to the open sea. And they do it backwards, because it's easier for tugs to manoeuvre them that way. 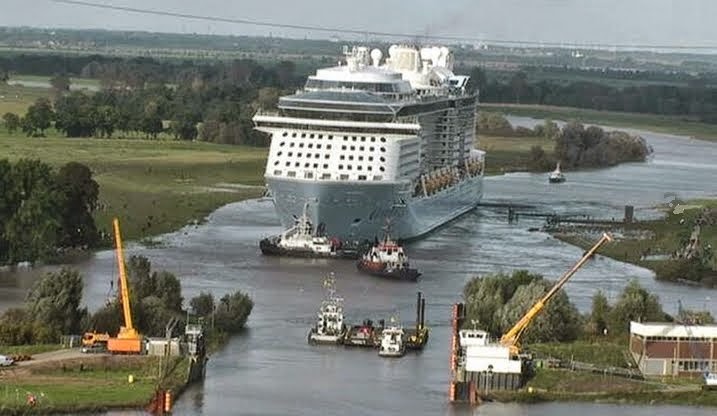 Meyer Werft has been building ships at its inland yard for over 200 years to avoid the impact wild North Sea storms can have on those yards on the coast, the latest being Quantum of the Seas for Royal Caribbean International that launched just last month. At 168,666 tonnes and with berths for 4,900 passengers, it was the biggest ship ever to make its journey down the River Ems from the Meyer Werft yard. In places there was just over one metre leeway between ship and shore, in others power lines had to be re-routed because of the vessel's enormous size, and even bridges removed in others – including one carrying the main railway line linking Germany with Holland. 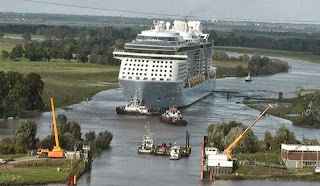 Quantum of the Seas cost US$1b and is now in Holland for sea trials. It will begin its cruising career with a sailing from America to the Caribbean in November.